The Common Bedbug - Cimex lectularius - are hitchhikers, which means that someone must physically bring them to your home. They can enter the home in the infested luggage of a guest, or perhaps in infested furnishings brought into the house. 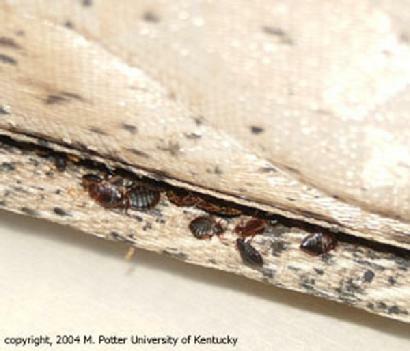 Luggage, stored in closets of an infested hotel room, could be the place the bugs go to after feeding, and once inside a suitcase it is almost impossible to see them.Moving vans are prime suspects for moving bedbugs around the country; trasfering bedbugs from one person's possessions into the next customers belongings. These parasites are usually no more than ¼ inch in length in their adult state and can engorge themselves with human blood in less than 15 minutes causing their bodies to fill to as much as three times its usual size. Fully engorged bedbugs bear little resemblance to their original state and are often thought to be a different insect altogether, such as ticks. Bedbugs are attracted by both warmth and the presence of carbon dioxide, much like mosquitoes. The bugs climb up onto your skin and pierce you with two hollow tubes, one of which injects anti-coagulants (blood thinners) and anesthetics (so you don’t feel the bite and swat the little buggers.) The other tube is used to withdraw your blood, feeding for about five minutes before returning to their hiding places. Bedbugs can lay between one and five eggs per day with an incubation period of 10 days in warm weather (slightly longer when cool). A single, pregnant female bedbug could begin an infestation as she begins depositing her several hundred eggs in a new habitat. Nymphs (baby bedbugs) are capable of going without food for up to 80 days if necessary. The bedbug is a survivor and can live for up to 8 months without feeding. In infested homes, some studies found that 70% of the bedbugs were residing in, on, and very close to the beds, but another 23% were in the recliners or couches in other rooms. 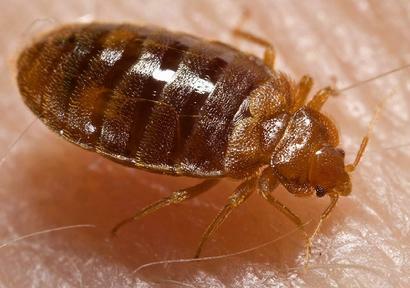 Wherever people sleep, bedbugs will be found hiding. A few places where they hide are in closets full of clothing, creases in bed linens, seams, tufts & under buttons on mattresses, inside the box spring, in drapery pleats and hems, beneath loose wallpaper, dressers, fancy beds, in headboards, desks, entertainment centers and nightstands, behind base molding on the floor or behind wall-mounted artwork, etc. Using a flashlight, carefully inspect linens for bed bugs. Tell-tale signs of bedbugs are crawling insects, blood spots on the sheeting, excrement (which from bedbugs looks like a loose scab) and cast skins. Use a canister vacuum with hose attachment and vigorously attack all the seams, folds, buttons, and edging of the mattress. Don’t forget to vacuum the baseboards of the room as well as any furniture that is nearby, like nightstands. You could also use a steam cleaner to deep clean the mattress after vacumming. Keep in mind that bedbugs do move through wall voids to adjacent rooms and could be carried by a warm body into the living room or den. So any areas you stumble to first thing in the morning need to be subject to the same treatment as the sleeping chambers are. Aggressive cleaning is the key to bedbug eradication. Stop scratching, get out the calamine lotion and get to work! Think of it this way, you may end up with the cleanest house in a 10 mile radius. There’s always a silver lining if you look hard enough!